A closer look at the report reveals that Chinese student enrollments increased by 10 per cent with Chinese undergraduate students now out pacing graduate students in the United States. India, on the other hand is driving graduate enrollment growth. And then, there is the emergence of Nigeria as a key source country for students choosing the US. With so many micro-dynamics playing out, it can be almost impossible for individual institutions to remain on top of these trends and to deploy sufficient resource to take full advantage of them. One of the more interesting analyses was carried out by Karin Fischer and colleagues at the Chronicle of Higher Education. In her feature, she identified that beyond the headline figures, there are significant variations in performance with some of the large public universities growing international enrollments disproportionately and others either losing share or declining in enrollments. In some cases, such as the University of Texas at Austin, international enrollment growth has been restricted by the State Legislature which introduced measures stipulating that 90 per cent of freshman classes must come from within the state. In most other cases, however, it appears that the issue is one of resources and reach. As the feature points out, large public institutions with strong international reputations and entrepreneurial leadership have been able to take advantage of the opportunity. We wouldn’t disagree with this – but are also keen to explore an alternative phenomenon playing out in the figures. Some institutions, recognizing the power of their brand and the quality of their education, have developed partnerships in efforts to boost enrollments and international student performance rates. INTO is partnered with seven universities in the United States – and in this piece we explore how our partners have fared in the data. We focus on our first three partnerships – which illustrate the trends. The results have been uniform – with a clear link between the depth and length of the partnership and the enrollment performance of the University. The table below identifies the performance of three INTO partners in this year’s Open Doors release – combined with the International Student Economic Value tool produced for NAFSA by the University of Indiana. 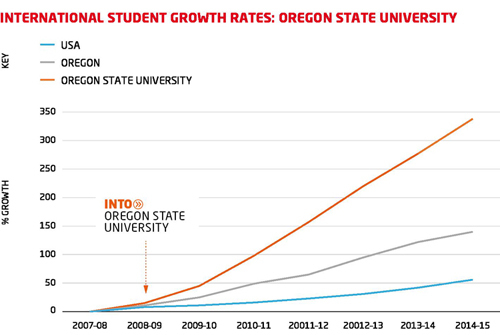 Oregon State University has grown international enrollments faster than the state and national averages for every year of its partnership with INTO. In fact, Corvallis, the home town for the OSU campus has been identified in August 2014 by the Brookings Institution as the fastest growing metropolitan area in the United States for F-1 visas. According to the latest Open Doors data it is now the number one recruiter of international students in the State of Oregon, generating $125m in annual revenues and supporting 1646 jobs in the state. It has grown international enrollments by 358 per cent since 2005/06. INTO’s second partner in the United States shows a similar trajectory, with the inflection point in enrollments coinciding with the launch of the partnership with INTO. USF is now the number two institution in the State of Florida for international enrollments and home to more than 4,000 students from 100+ countries supporting more than 1,000 jobs. There have been commensurate increases in international student retention and graduation rates. 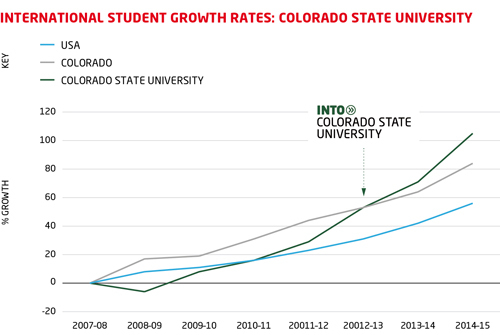 The same pattern is also evident at Colorado State University, which partnered with INTO in 2012. Once again outperforming both State and national enrollment growth averages. Our latest Fall 2015 Enrollment data release indicates that George Mason University is on a similar journey – recording a record 685 enrollments on the INTO George Mason pathway programs and a very noticeable upswing in overall university enrollments. As the Chronicle rightly points out, strong, entrepreneurial and visionary leadership is also a common theme in driving international enrollment growth. In our partners’ cases, this is also supported by carefully designed partnering models, based on principles of shared governance which enable the university to extend its reach into the global pool of ambitious students. However, that in itself is not enough. Everything begins with a commitment to ensuring international students are as well prepared as possible for the rigours of an American university education, through the provision of high quality, university-delivered preparation programs that are fully integrated into the wider university curriculum. Likewise, the presence of these students must be well-leveraged in order to enhance the educational outcomes for domestic student who are also preparing to join a global workforce. Well designed, carefully thought through and sensitively constructed, these partnerships can and do have the potential to transform universities and the communities they serve. The presence of international students on campus enriches the experience for all students, promoting understanding and better preparing graduates for the inter-connected, global world they will graduate into. In times of extreme fiscal challenges, the additional revenues make it possible for institutions to continue to invest in mission-enabling projects and initiatives. But the hunt for additional tuition dollars should never be the core driver of the search to bring international students onto the campus. Not every partnering model is born equal. The world is more challenging and competition for the brightest and the best international students is intensifying, not just across the United States, but the world. As Rahul Choudhaha points out in his excellent piece in University World News we need to retain focus on understanding the complexity of the international student universe and on how to enhance students’ chances of success. This is a project we are eager to support as it helps create a higher education sector that is committed to delivering the very best experiences to students from wherever they come. 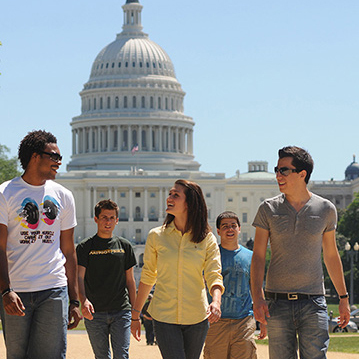 International students bring immense benefits to college campuses across the world. Reaching and supporting them and ensuring their presence benefits the entire campus community can be challenging and a daunting prospect. If a university does choose to work in partnership with a third party, it is vital that they work with organizations which share their values, are committed to student success and have the breadth of expertise, knowledge and awareness of the international student market to enable long term enrollment transformation to happen.